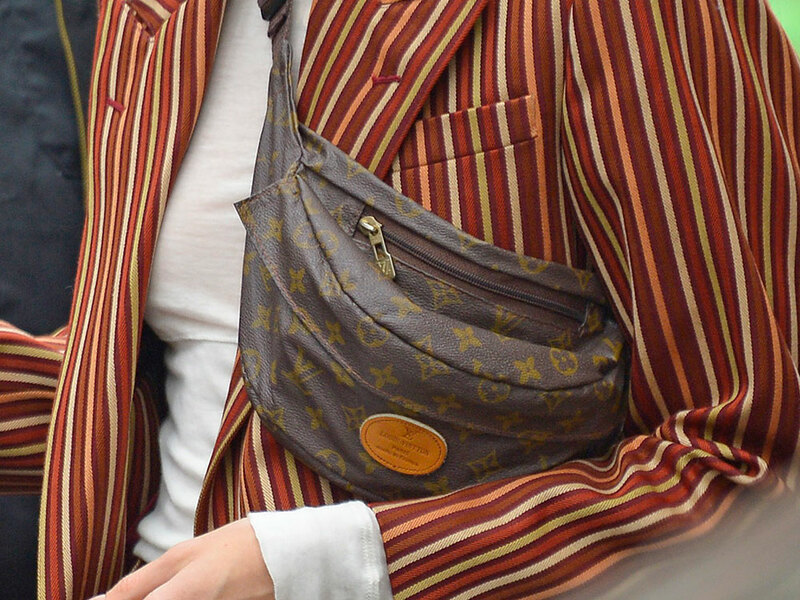 Early last week, we posted a look at a curious new interest Kendall Jenner had taken up: vintage designer fanny packs. Our evidence consisted of two such fanny packs that Ms. Jenner had worn several times each, including one that appeared to be Louis Vuitton. You guys had a lot to say about this bag and its questionable authenticity, so we did some digging to figure out if Kendall might be carrying a fake. I has also wondered about the bag since pulling the images for Emily to write about (a little peek at how the PurseBlog sausage is made! ), but because I'm not an expert in vintage or authentications, I figured it would be more interesting to see if any of you guys had thoughts. Based on your comments, we did some research and drew some conclusions—check out our investigation below. Unless you're a vintage nut, a Louis Vuitton nut or both (two great tastes that taste great together, IMO), you've probably never heard of The French Company, and that's for good reason: it's an era that LV would rather forget. From the mid-1970s to the early 1990s, The French Company was a US manufacturer that legally produced bags under the Louis Vuitton name through a licensing deal. That means that LV gave The French Company permission to use its logos, signature shapes and name in exchange for a fee, and then The French Company, already an existing luggage manufacturer, took it from there. These bags were only sold in high-end department stores the United States, and the partnership came about in order to fill a burgeoning demand for luxury goods in America that Louis Vuitton's European factories couldn't keep up with. The French Company used their own leathers and materials, though, which is why bags made by the brand may look fake when compared to vintage pieces manufactured by Louis Vuitton during the same era: the colors, hardware, labels and linings are indeed a bit different. Nah, fam. The existence of the old The French Company bags makes it a little tricky to tell unless you look closely, though, because some of its designs included exterior oval patches made of leather that could be hot stamped with letters for personalization after purchase. The tags on the authentic bags are blank, but some counterfeiters have added similar patches to fake bags with Louis Vuitton's logo or brand name already stamped on them, essentially creating fake versions of the licensed French Company bags. If you see a bag with an oval leather exterior tag and any branding stamped in it, that's a dead giveaway the bag is fake. Kendall's fanny pack is stamped, so it's fake. Why Would Kendall Jenner Carry a Fake Bag? Well, there are two options, really: First, it's absolutely possible she and her stylist didn't know. The Kardashian-Jenner clan recently moved on from longtime squad stylist Monica Rose, and that means Kendall is being dressed by someone new, trying new things and probably being sent options from channels she's never used before. Constant paparazzi attention means getting unique pieces and differentiating herself stylistically is important for the young star's public image, and the only way that's sustainable is to source from both vintage collections and indie designers, as well as the big brands she and all her model buddies wear frequently. It's possible this fanny pack slipped through in a vintage pull and both Kendall and her stylist felt no need to question its authenticity because they trusted the source. The second option is that they knew or suspected it was fake and didn't care, not only because it looked cool and fit the vibe they're going for, but also because streetwear's influence on fashion in recent seasons has shifted some influencers' attitude toward fakes. For instance, Gucci recently launched a line of t-shirts that mimic the fake logo tees that ripped off the company in the 90s and 2000s. For a certain sect of the ultra-elite, daring to wear something obviously fake (or, in the case of the Gucci shirts, something that acknowledges fake designer merchandise as having a distinct aesthetic of its own that's worth exploring) is the ultimate form of normcore: are you hot enough to make something impossibly, aggressively lame and unluxurious work? Can you elevate the aesthetic of the masses simply by virtue of your own coolness?